Creating in Maya, encounter error. Things are going well with modelling objects in scenery, however I encounter errors which I can not fixed. From what I read on help forum (autodesk), it is to do with version error. Which I can not do anything about it, it seems the education version in college may be the cause of creating the error to my work. So I thought, restarted maya once more, but click on “Ignore version” and fixed the problem. I thank tristanb3d for the solution. The layout looks exact position from the scene view I have drawn, what it really needs are texturing & lightning. But I think what it really needs is tone lightning and I need to worry about what to do with glass attaching to the metal floor. 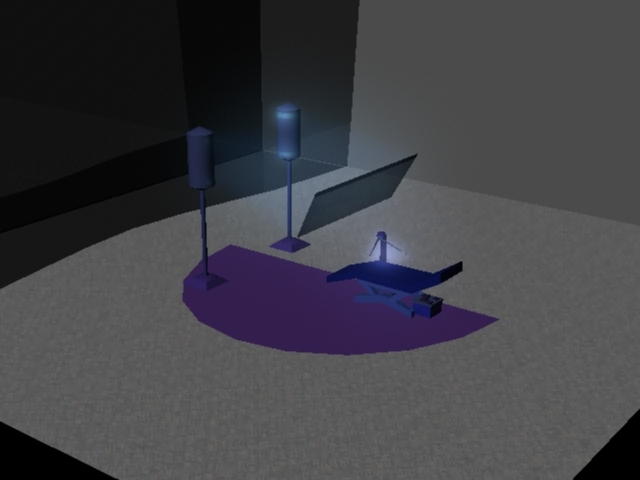 Next is in mental ray, I added glow intensity to see how it goes, so far, its going great. I also added in a carpet, it going to be turned as a small fluffy carpet; the base colour is already shown on these two pictures.